of scours in calves, lambs & kids. Scours is a general condition of moderate to severe diarrhea caused by multiple organisms. The diarrhea that accompanies scours is the body’s natural response to toxins in the gastrointestinal tract. SweetPro’s Paste contains charcoal to bind some toxins, functional proteins to combat pathogenic organisms, probiotics to seed the intestine with the appropriate population of microorganisms, and Probiotien (a prebiotic that provides substrates for the appropriate population of microorganisms). • For best results give one dose after birth and then at the first sign of scours, repeat as necessary. 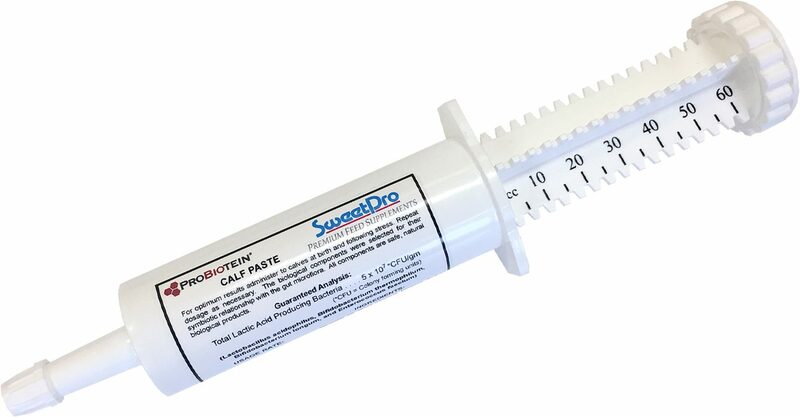 • One tube provides 60 grams of paste or sufficient paste to tube 3 calves. • Can be fed to lambs & kids as well as calves. • No refrigeration required; best when used within 2 years of lot code date.